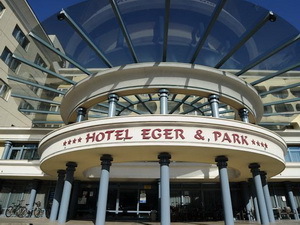 Eger hotels. 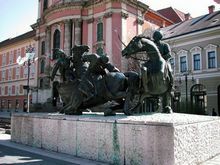 Travel guide of Eger, Hungary. 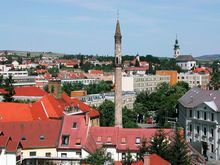 Situated in its own sunny valley between the Mátra and the Bükk, EGER is famed for its wine, its minaret, and the heroic legend attached to its castle. 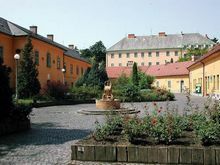 From Eger, buses and local trains head to various villages bordering the Bükk national park, notably Szilvásvárad near the beautiful Szalajka Valley to the north, and Cserépvarálja to the northeast, just below the "rocking" stones in the Felső­szoros ravine. Thus you can enter the Bükk Mountains from the west, or cut straight through on a bus to Miskolc, and renter them by train from Lillafüred after you've finished with Eger. 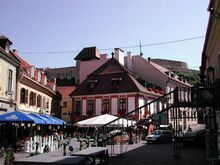 With its colorful architecture suffused by sunshine, Eger seems a fitting place of origin for Egri Bikavér, the potent, throat rasping red wine marketed as Bull's Blood abroad, which brings hordes of visitors to the town. A Baroque Festival is celebrated in July and early August, but the Szüret or Harvest Festival in September is when Eger is at its liveliest, with two weeks of numerous wine related events around town, including folk dancing and a parade of floats. 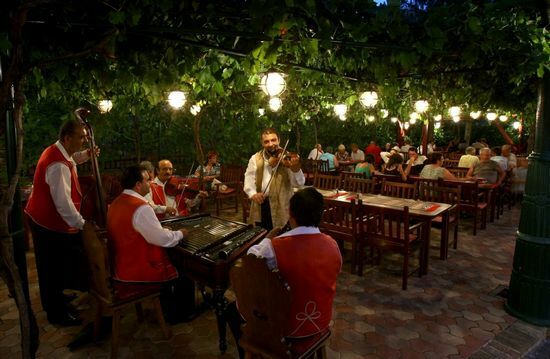 Despite occasional problems with accommodation, it's a fine place in which to hang out and wander around, not to mention all the opportunities for drinking. Occupying. 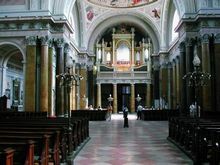 a site hallowed since the eleventh century, Eger Cathedral looms above a flight of steps flanked by statues of saints Stephen and László, Peter and Paul, by the Italian sculptor Casagrande. 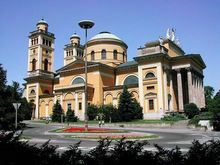 Constructed between 1831 and 1836, this ponderous Neoclassical edifice was architecting József Hild's rehearsal for the still larger basilica at Esztergom. Its interior was largely decorated by J.h. Kracker, who spent his last years working in Eger. Particularly impressive is the frescoed cupola, where the City of God arises in triumph as evildoers flee the sword. 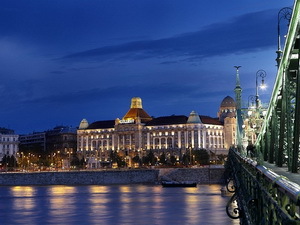 Close by, facing Széchenyi utca, stands the Archbishop's Palace, a U-shaped Baroque pile with fancy wrought-iron gates. 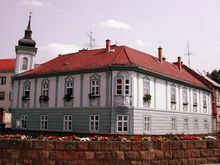 In the right wing of the palace you'll find the treasury and history of the bishopic of Eger, while another wing now serves as the headquarters of Egervin, the local wine company. 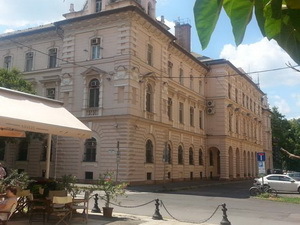 The florid, Zopf-style Lyceum, opposite the Cathedral, was founded by two enlightened bishops whose proposal for a university was rejected by Maria Theresa. Now a teacher training college (named after Ho Chi Minh during the Communist era), the building is worth visiting for its library, which has a huge ceiling fresco of the Council of Trent by Kracker and his son-in-law. The lightning bolt and book in one corner symbolize the Council's decision to establish an Index of forbidden books. Even better, check out the Observatory (same hours as library) atop the tower in the east wing, where a nineteenth century camera obscure projects a view of the entire town from a bird's-eye perspective. The camera's monocled curator gleefully points out lovers kissing in the back streets, unaware of surveillance. From the Lyceum and Provost House across the way, Kossuth utca leads past a Franciscan church (where a mosque stood in Turkish times) and the County Hall, whose magnificent gates were wrought by Henrik Fazola (notice the stork with a snake in its beak and a vine in its claws, on the county coat of arms). 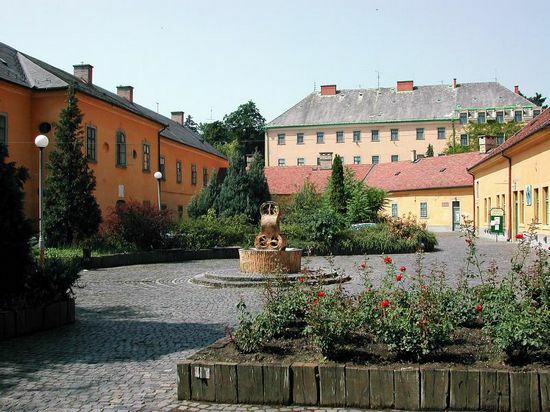 The same man who designed the gates was also responsible for the prison bars in the old Eger jail, now the home of a small museum on local history and artifacts. 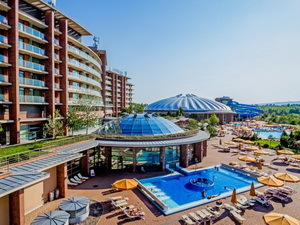 If your Hungarian is up to it, the friendly curator will give you an enthusiastic lecture on Eger's local swimming team and water polo club whose members formed the basis of the national Olympic team. Otherwise, printed information is available in English detailing the exhibits of each room. Continuing along Kossuth utca across the bridge you come to the "Buttler House" that featured in Mikszáth's novel A Strange Marriage. Alternatively, follow Bajcsy-Zsilinszky or Érsek utca into Dobó István tér, the starting point for further sightseeing. 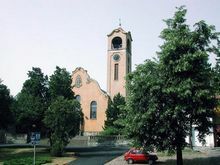 Along one side of the square stands the former Minorite church, a twin-towered Baroque edifice completed in 1771. The Latin inscription above its entrance asserts that "Nothing is Enough for God". 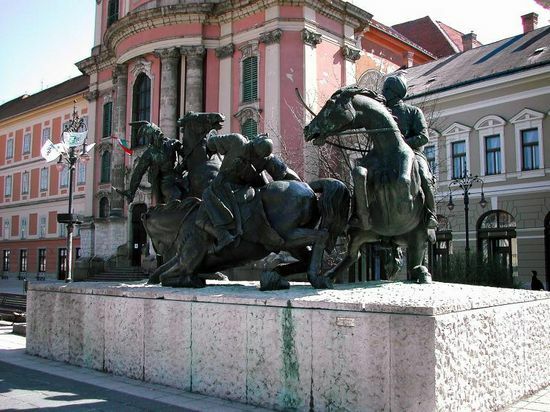 Equally striking are the action-packed statues of warriors that commemorate the two sieges of Eger during the Turkish invasion - a tale of heroism known to every Hungarian. Next door to the church is a small Palóc folk art exhibition. The first siege of 1552, described in Géza Gárdonyi's panegyrical novel Egri csillagok (Stars of Eger), was an unexpected victory for the Magyars. 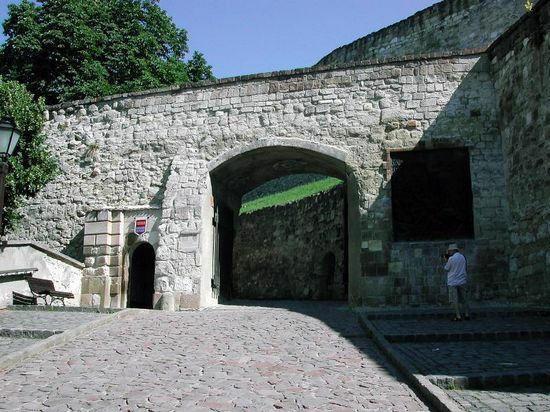 Ensconced in the castle under the command of István Dobó, two thousand soldiers and Eger's women (who hurled rocks, hot soup and fat) repulsed a Turkish force six times their number -shattering the impetus of the Ottoman advance until 1596. In their second attempt, however, the Turks triumphed. 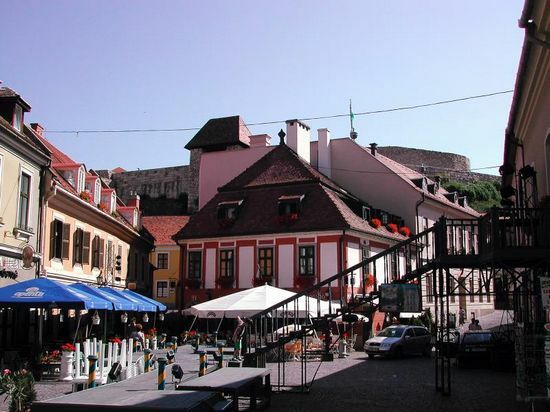 Eger's garrison of foreign mercenearies surrendered after a week and the Ottoman troops sacked the town, leaving only "blackened walls and buildings razed to the ground" and "the naked bodies of Christians baking in the sun, in some places four yards high". A short distance from Dobó István tér are two relics of the Turkish occupation (which lasted until 1687). 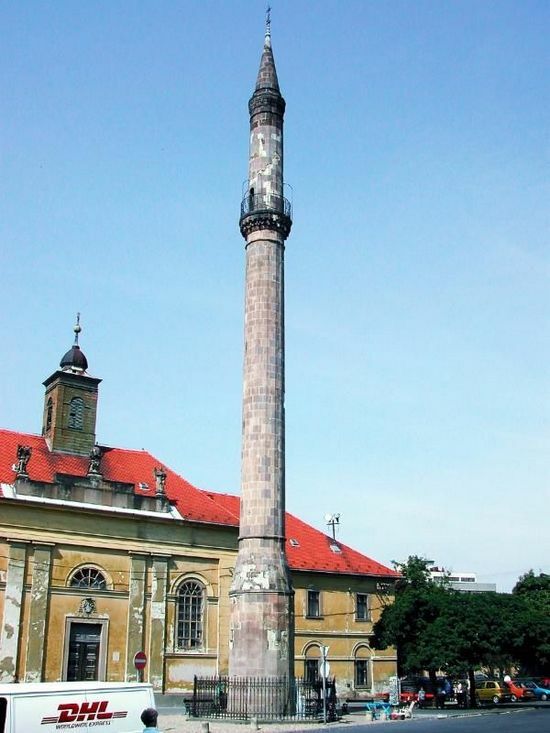 Eger's most photographed structure is a slender, four­teen-sided minaret, rising forty metres above Knezich utca. Despite looking rather forlorn since its mosque was demolished in 1841, the minaret offers fine views from its balcony - if the door is locked, the reception desk of the adjacent Hotel Minaret will loan you a key. A passing glance suffices for the unimpressive remains of a Turkish Bath, en route to Eger Castle. With every approach covered by batteries of cannons, you can easily appreciate why Eger Castle was so formidable. 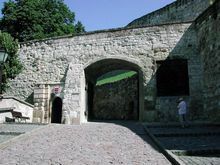 Ascending from its cower gate past the Gergely Bastion, you enter the inner section of the castle through the Várkoch Bastion. On top of this lies the tomb of Géza Gárdonyi, on which is inscribed "Only his body lies here". Separate tickets for the Bishop's Palace and the underÂ­ground Kazamata are sold at the ticket office straight ahead. If you feel so inclined, you can also invest in an historical video and English-language cassette for a do-it-yourself tour. One of the few Gothic structures left in north-eastern Hungary, the Bishop's Palace harbours a museum containing tapestries, Turkish handicrafts and weaponry. 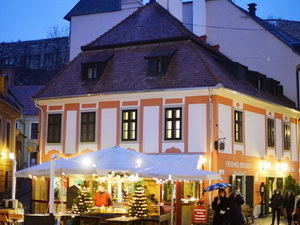 On the ground floor are temporary exhibits and a "Hall of Heroes" (Hősők terme) where István Dobó is buried amid a bodyguard of siege heroes; the latter carved in best Stakhanovite style. 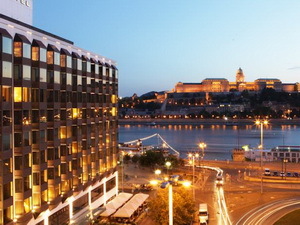 The adjacent art gallery boasts several fine Munkácsys and three romantic Transylvanian landscapes by Antal Ligeti. To the east of this complex lies a jumble of medieval foundations signposted as a Romkert or Garden of Ruins. 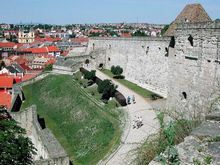 Here stood Eger's Gothic cathedral, which was damaged by fire in 1506 and used as a gunpowder magazine during the first siege; the Turks used it as an arsenal "to spite the Christians". To the south, tour groups gather outside the concrete tunnel entrance to the Kazamata or underground galleries, a labyrinth of sloping passages, gun emplacements, deep-cut observations shafts and mysterious chambers. Although the Wine Museum at Városfal utca 1 offers a display of viticulture implements to whet your palate, it's more fun to go drinking in the Szépasszony Valley, just west of town (accessible by taxi). The "Valley of the Beautiful Women" is surrounded by dozens of vineyards producing four types of wine - Muskotály (Muscatel), Bikavér (the famous Bull's Blood), Leányka (medium dry white with a hint of herbs) and Médoc Noir (rich, dark red and sweet; coats your tongue black). Finding the right wine cellar is a matter of luck and taste - some are dank and gloomy, and some have their own musicians. Most cellars are open daily until 6-8pm or later, depending on custom. 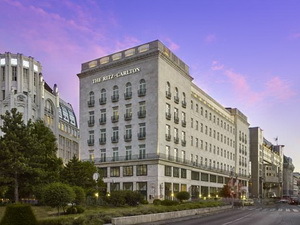 SEE EGER HOTELS ON THE MAP! 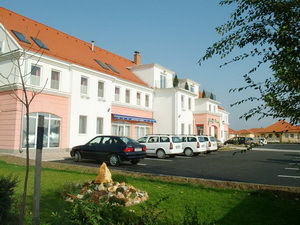 3-star hotel in Eger, 150 kms from Budapest. 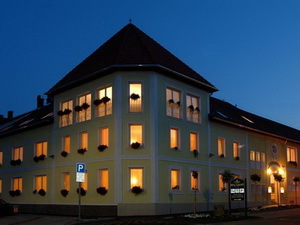 The Hotel Eger & Park is situated in the center of baroque town Eger, at the feet of Bukk mountains, which are abounding in natural beauties. The county seat - which is rightly famous for its excellent wine and medicinal water. 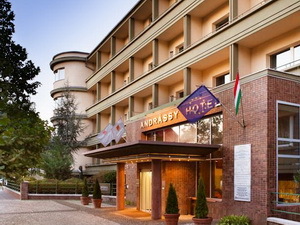 4-star hotel in Eger, 150 kms from Budapest. 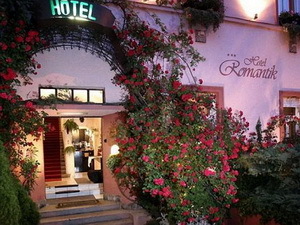 Hotel Korona is the first private hotel in Eger situated in a quiet part of the town centre. Eger is famous for its baroque and Turkish buildings and bath. Its wines are known all over the world. 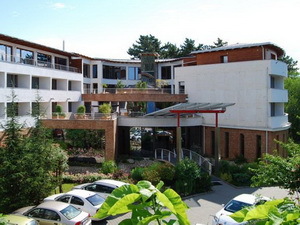 Hotel Eger*** & Park ****, a patinated hotel complex, is situated in the inner city, 500 meters from Dobó Square, the historical center of Eger, and next to Gárdonyi Géza Theater, the center of cultural life. The most important sights, museums are in the neighborhood. 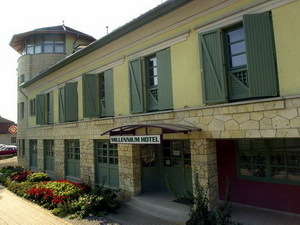 This family-oriented hotel is located in the centre of Eger, at about a 50-meter distance from Szechenyi Street, Eger's main pedestrian street, free of car traffic.